Yep, that's the former Kil2, bringing solo back to null-sec and popping tacklers right and left with his super-charged dev-hack implant set coupled with a fun self-rep Machariel fit. Auroras, incidentally, are dev implants that add a variety of over-powered effects... I'm sad to have missed it, but apparently this was a fun little fight! CCP Rise managed to pop at least four tacklers, but in the end, three Rapiers did what the smaller tacklers couldn't and soon he and his Mach were covered in Taloses from which there was no escape. gf! First honorable mention goes to this fun little gank. That's not how you fit a exploration Tengu... Nice kill, Marmite Collective! There was also this sweet Vindi kill, but the small gang that killed him got absolutely skunked by the loot fairy... ouch! Kudos to the Vindi pilot for bringing the fight, though! And finally, this Archon just made me smile. Apparently it's important to rat with every blueprint you own in your cargo hold. First up this week was this Pandemic Legion Erebus. A "...free titan to all new recruits who don't have a titan," says the corp description for Seleene's Body Count Inc., one of the oldest corps in EVE. These are great folk; I got the opportunity to have dinner with them at Fanfest. But one has to wonder if this pilot took BDCI up on the titan offer, since this guy apparently didn't have it that long. ;-) EVE News 24 has the full story, but short version: bait titan with carrier acting dumb, wait for titan to DD carrier, bubble and kill titan with waiting fleet. The accompanying video is also pretty amusing, showing that a reinforcement Aeon got knocked into structure before the rest of the PL reinforcements finally arrived... Really good kill for Black Legion! Second and last super to die this week was Marlona Sky's Nyx, killed as his part of the EVE tenth anniversary celebrations on Sunday. 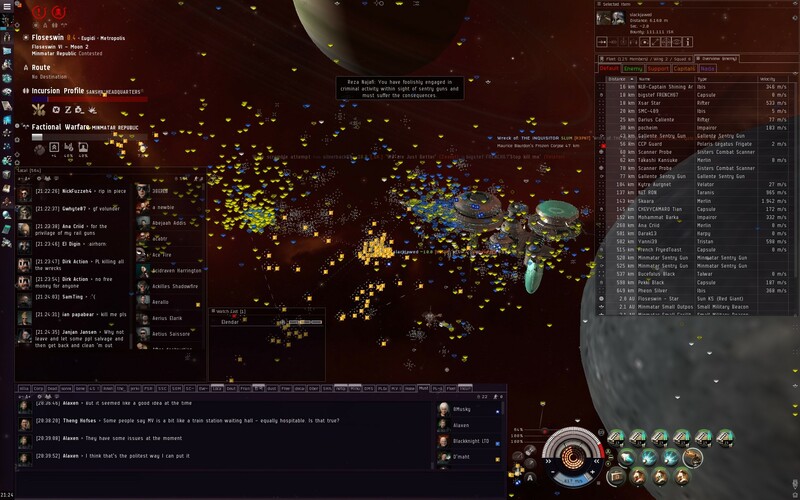 An stupendous 2349 people are on the kill-mail, pretty damn good for a single system in EVE. From what I understand, if you wanted to get in on this one, you needed to be in system a good three or four hours before the fight started. I wasn't there, but the reliable rumor is that PL showed up and was able to keep Marlona repped, so he apparently had to self-destruct to actually die... Really cool event, Marlona! That Tengu is not an exploration fit. See the interdiction nullifier? Warp core stabs? It is a travel fit. Obviously headed from null to Jita, to bring all that juicy loot to market. I wonder how it got tackled in the first place. With a stealth cloak, there's not much excuse. It's likely a exploration fit that he hastily refitted subs to use as a travel fit to haul his exploration loot to jita. He has the probe launcher still fitted and all the OPE/deadspace loot in his hold, after all. With the combat probes, big tank, and killed in 0.8 with CONCORD's approval. Perhaps a ninja looter caught in the act? PL is where the fun ends, Rote is just a speed bump. ::chuckles:: It was Rise's fault. He got overconfident when he started popping those tacklers. "From what I understand, if you wanted to get in on this one, you needed to be in system a good three or four hours before the fight started." Nah. RVB Ganked flew in maybe 15 minutes before. I was reshipping and went through the gate and warped to the fleet right as the Nyx undocked. Granted, it was the longest TiDi warp I've ever been in, but I got there. That is something I have been meaning to ask about... how did the Nyx undock? How was it docked in the first place? I thought supers couldn't do that. Ripard, is your exploration fit still valid? I'm not sure how/if changes in the last year or so may have effected it. Yep, still valid. No changes needed. We (PL) only managed to make it to the ingate once the nyx had already undocked and was at ~85% armor. The bulk of the main fleet had no problems jumping in, except for the characteristic long loading timer. However, local was capped about 5-10 minutes later and a few of our stragglers died to a razor gatecamp that quickly formed to kill the cut-off pilots.